The number of foreign students in Austria has doubled in the last 10yrs but the number of Sub-Saharan Africans at most Universities has either reduced or remained the same. Currently the number of Africans in Austrian Universities lies at 771, a mere 0.257% of the total matriculated students during the WS 2012/13. The Südwind Magazine recently spoke to a Kenyan student, Malaika Bahati and the VAS Chairman Youssouf Simbo Diakité. Who shared about their lives as African students in Austria. Both of them agreed that the life of an African student in Austria wasn’t the best. 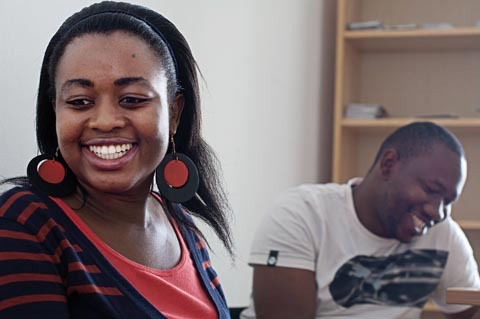 Malaika Bahati, whose parents pay for her tuition fees has an easier life, but to her being dependent on her parents wasn’t her idea of being in Austria. An Environmental Science student, she plans to leave Austria as soon as she completes her studies. In 2011, only 56 African students graduated from Austrian Universities, in 2010 it was 86 students. In 2011 there were 481 asian students who graduated, in 2010, 510 students. Third state nationals pay between €727 and €363 per semester for tuition fees depending on the University. Refugees and students from the “least developed countries” are exempted from paying fees but this varies from one University to another. The Austrian Integration Fund (Österreichische Integrationsfonds) sponsors 20 students annually by giving them €300 monthly and pays the tuition fee. The Austrian Exchange Service (Österreichischen Austauschdienstes, ÖAD) also runs a program dubbed, APPEAR, that runs exchange programs with foreign Universities, there are currently 63 scholars who receive €1000 monthly. The AAI and ÖH also have a social fund that support foreign students who find themselves unable to support themselves. Only issue is they only help once. Youssouf Simbo Diakité, the Chairman of the Organisation of African Students (Vereins der afrikanischen Studentinnen und Studenten (VAS), says “This is not enough”. According to Youssouf, most of the VAS members have student visas which are only valid during their time at the University. Most the chances to work is very limited. Students may only work between 10 and 20hrs per week, depending on which Semester the student is in. Youssouf adds that most students are only able to support themselves by working illegal jobs.